Sgt. Maj. Bradly D. Conner was born on March 5, 1966 in Tacoma, Wash. He was a Special Forces company sergeant major assigned to Company C, 2nd Battalion, 1st Special Forces Group (Airborne) at Fort Lewis, Wash.
Conner died May 9, 2007 from wounds sustained while conducting a combat patrol outside of Al-Hillah, Iraq. He deployed in support of Operation Iraqi Freedom in Mar. 2007. This was his fourth deployment to Iraq since 2003. A native of Tacoma, Wash. and raised in Coeur d’ Alene, Idaho, Conner enlisted in the Army June 24, 1987 as an ammunition specialist. After completing basic training at Fort McClellan, Ala., and advanced individual training at Redstone Arsenal, he was assigned to the 515th Ordinance Company, Redstone Arsenal as his first assignment. 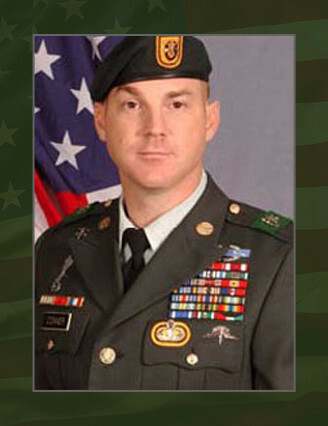 In 1992, Conner volunteered for Special Forces training and upon completion of the Special Forces Qualification Course in 1993, he was assigned to 10th SFG (A) as a Special Forces medical sergeant. He filled several positions in 10th SFG (A) to include 2nd Battalion S3 Operations NCO, Team Sergeant and First Sergeant for HHC. Conner’s awards and decorations include the Bronze Star Medal Second Oak Leaf Cluster, Purple Heart, Meritorious Service Medal Second Oak Leaf Cluster, Joint Service Commendation Medal Second Oak Leaf Cluster, Army Commendation Medal Fifth Oak Leaf Cluster, Army Achievement Medal Sixth Oak Leaf Cluster, Joint Meritorious Unit Award, Good Conduct Medal Fifth Award, National Defense Service Medal Second Award, Armed Forces Expeditionary Medal, Southwest Asia Service Medal, Kosovo Campaign Medal, Global War on Terrorism Expeditionary Medal, Global War on Terrorism Service Medal, Armed Forces Service Medal, Military Outstanding Volunteer Service Medal, Noncommissioned Officer Professional Development Ribbon, Overseas Service Ribbon, Army Service Ribbon, Kuwait Liberation Medal, NATO Medal, Combat Infantryman Badge, Master Parachutist Badge, Military Freefall Parachutist Badge and the Special Forces Tab. Conner is survived by his wife, Cynthia; his son, Aaron, his daughters, Katherine and Rachel, all of Fort Lewis, Wash. He is also survived by his parents William and Kay Conner of Coeur d’Alene, Idaho, his brothers Brian and Bruce Conner, and his sister Brenda Day.